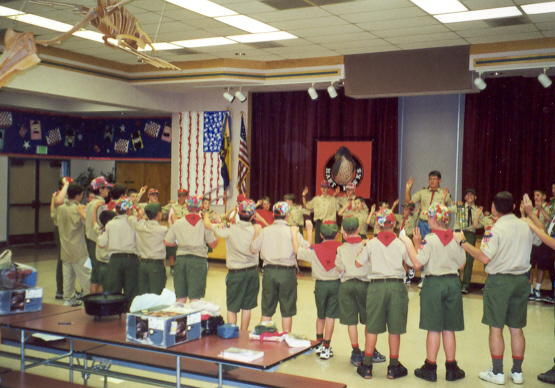 We are an active Boy Scout troop that meets at Hart Elementary School in the Southwest area of Bakersfield, California. Our program seeks to advance our young men to the rank of Eagle Scout through the learning of outdoor skills and developing character through youth leadership. To achive these goals, we offer activities that usually include a camping or hiking trip at least once a month. So if you are a boy or young man from age 11 to 17 who wants to have fun and learn about the outdoors, why not join our troop? All are welcome. Our troop is part of the Meridian District of the Southern Sierra Boy Scout Council, which is a network of Cub Scout Packs, Boy Scout Troops and Venture Crews that embrace the ideals of Scouting. The Boy Scouts of America was incorporated on February 8, 1910 and chartered by Congress in 1916 to provide an educational program for boys and young men that builds character, trains them in the responsibilities of citizenship, and develops personal fitness by emphasizing the values of the Scout Oath and the Scout Law. Give scouting a try. You will be glad you did. © 1998-2018. All Rights Reserved.